MP Jason Wood (left) with 4Cs Pakenham volunteers, including Committee Chairman Jim Wilson (second from right). Pakenham’s leading crisis relief provider has survived a tumultuous funding drought, despite supporting 12,250 local families in 2018 operating under a non-for-profit model. 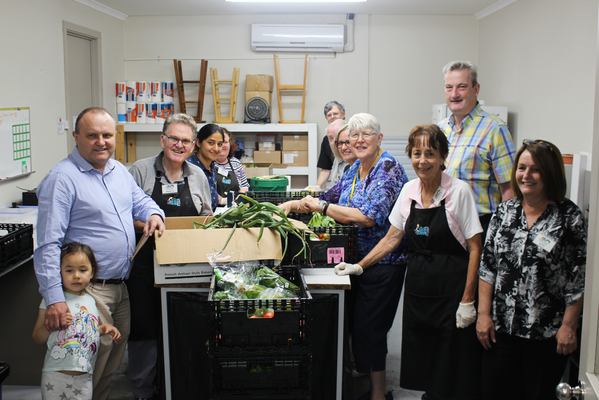 In a lifeline for the 4C’s, Federal MP Jason Wood has secured $150,000 for the service and Woolworths has opened the doors of the recently closed John Street supermarket for the provider to replenish stock. However, 4C’s Committee Chairman Jim Wilson revealed the hub is still only funded to operate for three days per week. He believes the organisation will need an additional $200,000 to return to a full-time schedule. Mr Wilson fears the impending Pakenham East development and Officer South residential precinct will further strain the 4C’s limited resources. “If we had $350,000 we can look after 12,000 families,” Mr Wilson said. To date, Cardinia Shire Council has contributed $45,000, the Federal Government $150,000 and the community had crowdfunded $2000. One outlier has yet to come to the table. “The State Government has given us nothing – which is quite disappointing,” Mr Wilson added. On Friday morning, more than 35 struggling families flooded the Princes Highway facility to access food. The 4C’s is also hoping that energy provider AGL will show some reprieve, considering it is slugged with $1500 monthly electricity bills. In late November, it was forced to temporarily close – despite Christmas being the busiest time of the year. Manager of the 4C’s, Cheryl Daly, said demand has again intensified in recent weeks. “We’re seeing a real increase now because school is going back,” she said. Attending the Pakenham hub on Friday, Mr Wood said he was delighted to have secured the 4C’s some relief. “I’m delighted to announce that my lobbying for transitional funding for 4C’s has been heard by the Federal Government,” Mr Wood said. The Latrobe MP said he will continue to fight for more funding, revealing plans to have Minister for Families and Social Services Paul Fletcher tour the facility. “We’ve got them through that tough period, and my goal now is to fight for more money. He has challenged the Labor State Government to match his funding.